One of the most favourite flowers of most of the world’s population soon gained the interest of tattoo artists too. 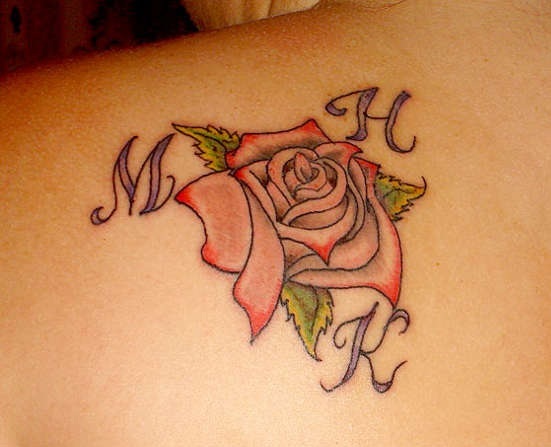 Rose tattoo designs have been popular among women for ages now and have also gained the interest of men by time. 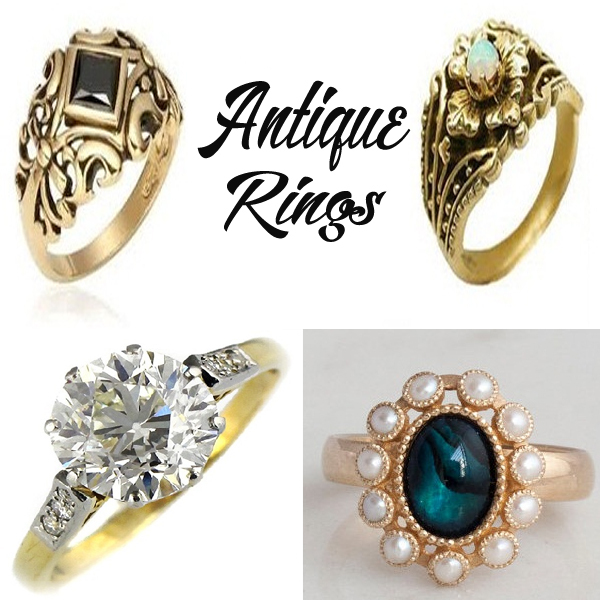 Artists ensure that the designs be done in such a way that suits the personality of the individual perfectly. Rose is also known as the king/queen of flowers and the epitome of beauty. You can come up with something custom stencilled out to suit your needs and sporting comfortability. You can have these in colour or in black and white. Have an idea of getting a rose tattoo? 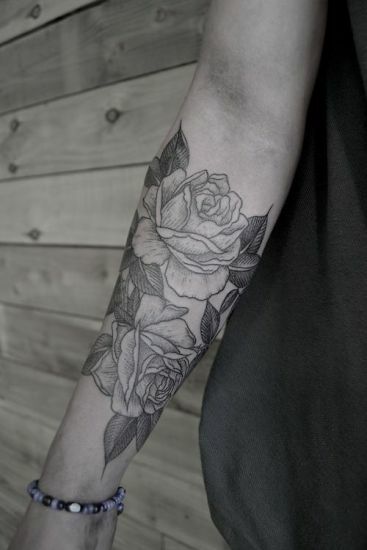 If you are thinking to get a rose tattoo and want a rose of some kind in it, you need to check out many kinds of rose tattoo designs out there that available for you to choose from. Get focused here to get an elegant one. 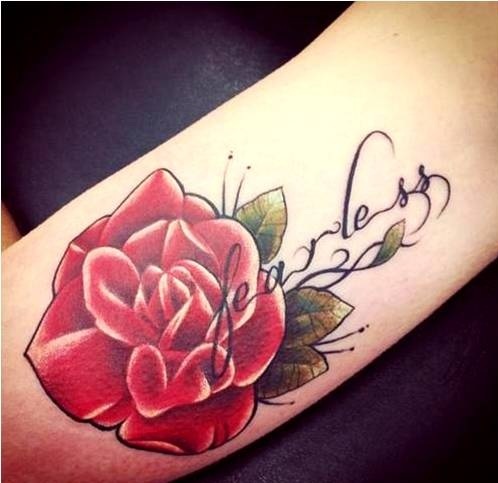 Here are top 25 lovely rose tattoo designs that will inspire you to try out something like this for yourself. 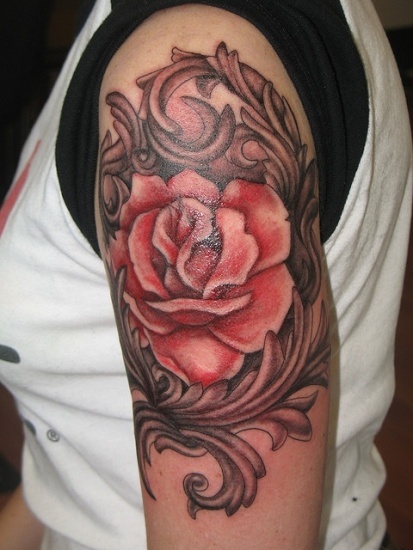 This is a very artistic rose tattoo design with a variation and twists which normal rose designs do not have. This has been done to custom suit the client’s need and you can too have similar designs done to custom suit your view points and likes. These types of designs can be very realistic and also might have 3D and shading effect to them. You can make these a Gothic looking depending on associated patterns. The colours can be chosen accordingly and you can get these in brown, red or pink and black being the primary colour. Size: Appropriate size will be medium to big. Skin Tone: Will look great on dusky skin tone. 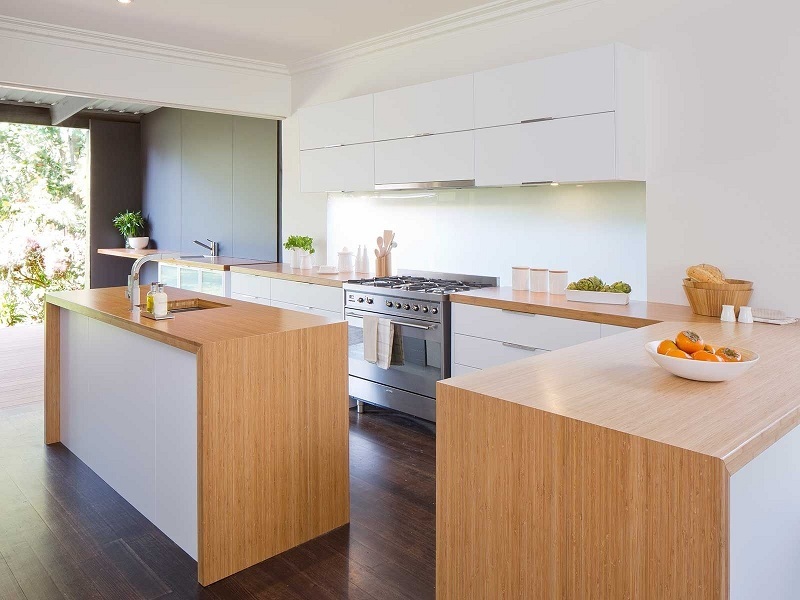 Looking for something that is small and easily hidden? Then you can have something as small as this. You can have it in various parts of the body. You can have it on the feet too. It depends on where you want this to be and accordingly your artist can make a design for you and then you can needle that out. 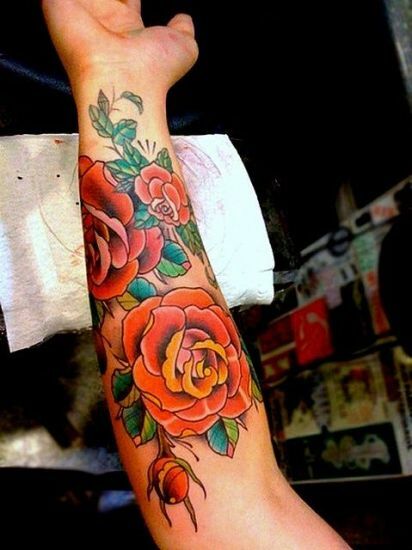 A perfect rose tattoo for the wrist, it depends whether you want colouring done or not. You can have it in brown and blue or you can have this in shading and fully in black. Both will look artistic if it is done properly. This looks trendy too so you can sport this with much ease and comfort. 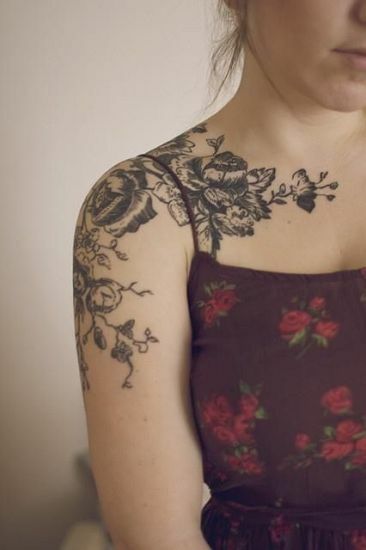 If you are willing to have just one big floral tattoo pattern then most people choose to have it in this type of a style. These have a lot of shading and 3D effect to these. This also has a lot of colours. If you want you can add water droplets to the flower and make it look more realistic. Objects can be added to these later if you want some modifications or additions to these types of things. So talk out this with your artist and she or he can guide you properly to a suitable custom stencil which will sit properly to your body portion where you want it done. This is an ideal rose tattoo designs for hands. If you want some colourful drawings then you can go for these types of designs. These are very artistic and different rose tattoos, you can have buds, leaves, thorns and also a dash of various tones of colours to give it much of a 3D effect. Much shading will be required and you will also be able to have this extended on other occasions when you want to. These types of styles can be extended whenever you want to. You can have other types of designs for the upper portion and make these associated with the lower portion to make it cooler. If you are willing to go fonts and have associated floral patterns then choose something like this. Even though this rose tattoo is done mostly in black ink, you can have it coloured too. You can leave the font in black and have flowers in colours. You can also do it the other way round. If you want you can add other types of flowers to this too. This can be extended later on if you want that to your lower hands as well. 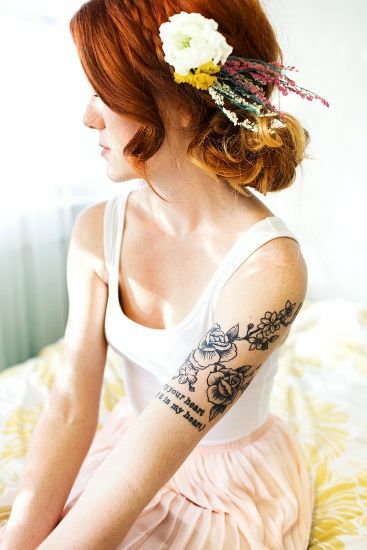 This is one of the amazing rose tattoos for females on bridal. These are done in black and grey ink. 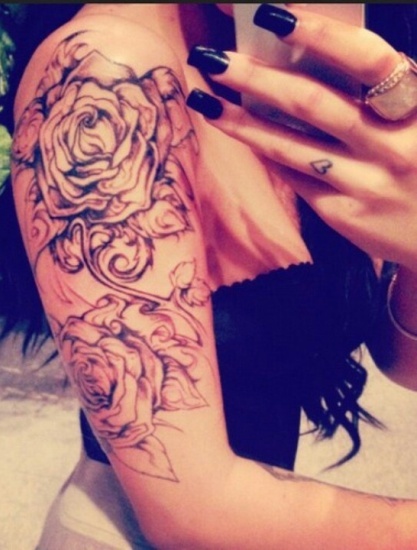 This rose tattoo for females has some shading to it and also these are quite huge to sport. If you want, you can make these smaller. These, however, are a choice that depends on a person’s personal comfort ability. These types of designs can be very artistic and represent types of emotions. You can make this cooler with a fun element or you can make these alongside other associated designs. This is just an outlined pencil drawing tattoo design and this may look like its lacking colour at a glance but this looks quite cool and you can sport this with much ease. Doing this unique rose tattoo in black ink gives you an option to easily cover this up using some makeup. This is cool for a girl and you can easily sport this with much comfort. Another thing about this is that it is not so large hence you can easily sport this and also with any type of dresses. 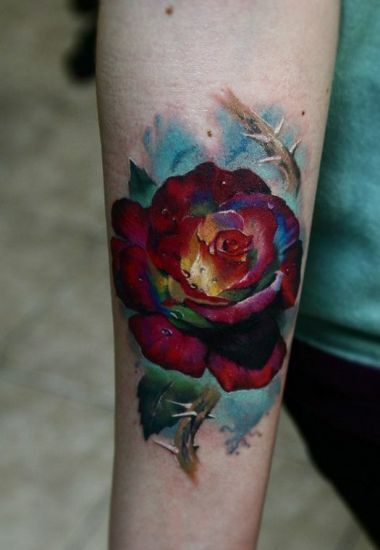 This is a painting style very realistic looking shaded beautiful rose tattoo. If you want a similar style then you can get it done in the look and feel that is very cool and very artistic. You can also talk out the shape of the area where you want it with your artist and you can have it done in various different colours. When this gets healed the colours will fade very little and you will have a very colourful effect. This is a very girly look and you can try this out if you are willing to have something that is more in black ink and not much in colour. Even though you can do this in colour, but we suggest that this will look more artistic in black and you can custom suit this design as per your choice and complexion. 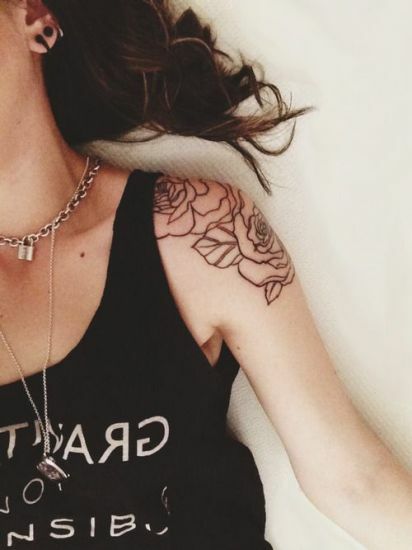 This is a cutest rose tattoo designs for shoulders. This is a painting style colouration done with the normal rose tattoo designs. You can try something similar or ask your pattern artist to make a custom design for you. You can try several other small or large or extended associated things of designs to go with this. These types of designs can be very artistic and represent types of emotions. 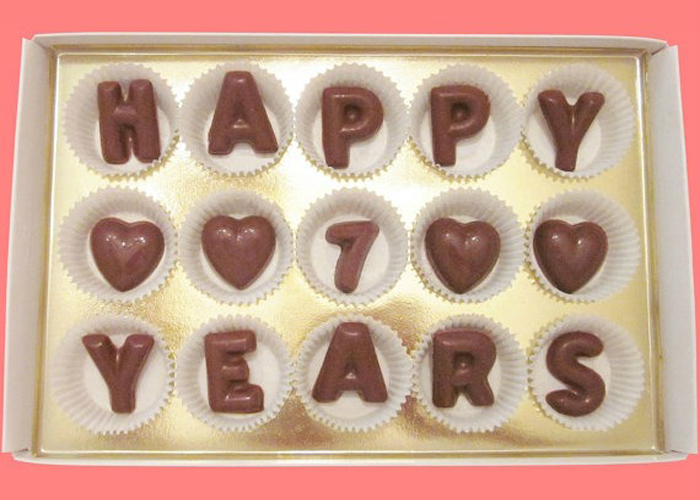 You can make these funny or cool with fonts and other small flowers. You can also make these alongside other associated writings. Ink Colour: Choose pastel pinks for this one. Suitable Gender: Much loved design by women. If you want a design on the shoulder or the collar bone, then try something like this. 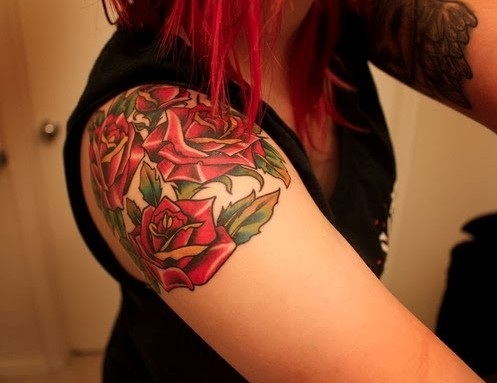 This picture of a rose tattoo is quite colourful and can be proper for girls. This can also be very in tune with some font. If you want to add some writings or you can even add some birds to this to make it more realistic. Skin Tone: Best on lighter skin tones. Suitable Gender: This style of tattoo is suitable for men as well as women. This can be quite a show for your hands. Especially if you want something that is less clumsy and more prominent, then try something like this. You can add some meaningful writings to this and also some birds or extend these types of designs later on. These are easily extensible and you can come up with new styles or some other objects that you might want to use along with these. So you can keep these simple for the first time and then you can add more things to this and make it more realistic. 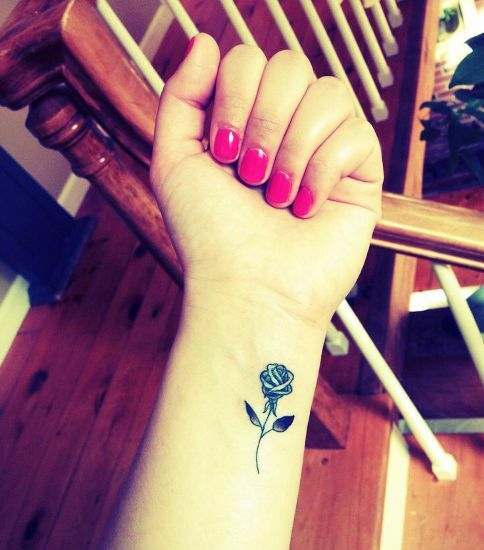 It is one of the perfect rose tattoos for girls. Skin Tone: Best on fair to medium skin tone. This is done on the frontal portion of your hands and you can make this in colour or simply in stencil black and white. You can also use some characterizations as per your choice. Even adding more objects like birds or more flowers can look cool. 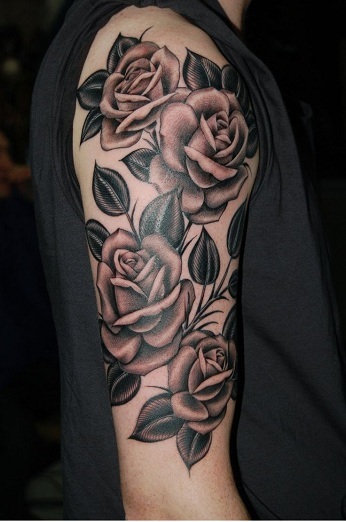 This is a beautiful rose sleeve tattoo and is something you can sport and also have fun sporting. Not everyone likes to have twigs and leaves along with a floral pattern, so if you want you can switch a custom made flower like this without the thorns, the leaves or buds or even a twig. These look quite colourful because the whole focus is on the flower. 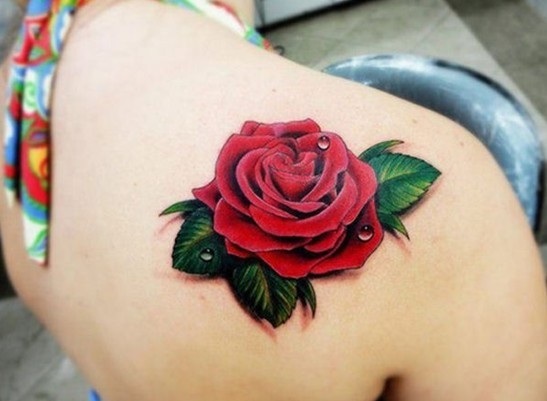 This is one of the best realistic looking rose tattoos for women. This is a very detailed rose tattoo on arm design and is done on the full of your hands from the shoulders down to the wrist area. So if you are comfortable with sporting such detailed designs as this one, then you can try out patterns like this. You can also have colouration’s done in detailed. However, these types of designs also look proper and suitable as per your complexion in either brown or grey and lack tones. Size: Make this in medium to big size. With no doubt, the rose is the most adorable breed of flower throughout the world. Some people will love this flower as they may have other symbolic meanings. Getting tattooed this rose back tattoo on the body will definitely look gorgeous that to having the roses tattoo designs with initials of some person will be unique and stylish. Body Placement: Place this design on the back, shoulder or arm. Ink Colour: Choose light shades of orange and green for this one. Size: Make it in small to medium size. Suitable Gender: This style is suitable for women. 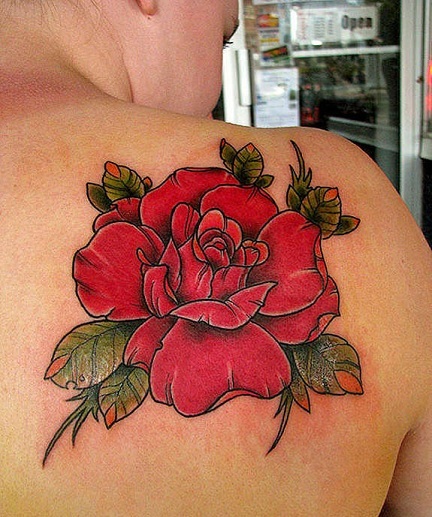 If you are trying to have a rose tattoo design, consider having red rose tattoos images as they are considered to be reluctant to the romantic implications as today we can see many masculine guys were wearing a rose tattoo. 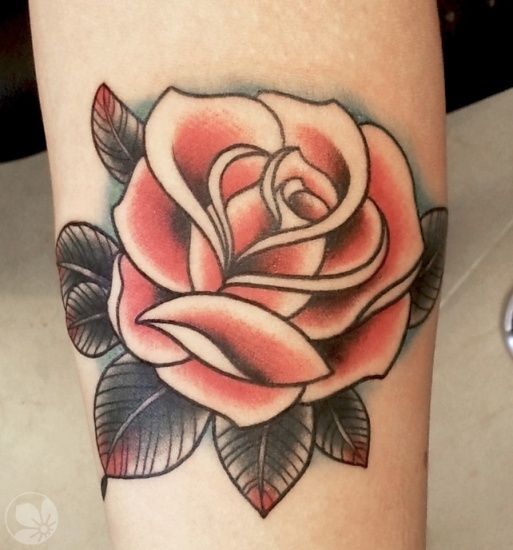 This is one of the best and definitely more attractive traditional rose tattoo designs. It is important to choose the right tattoo images as it can make the statement that you actually want to make with your tattoo. Before inserting a rose picture, you should know the exact meaning of it especially when you want to put in a sleeve. 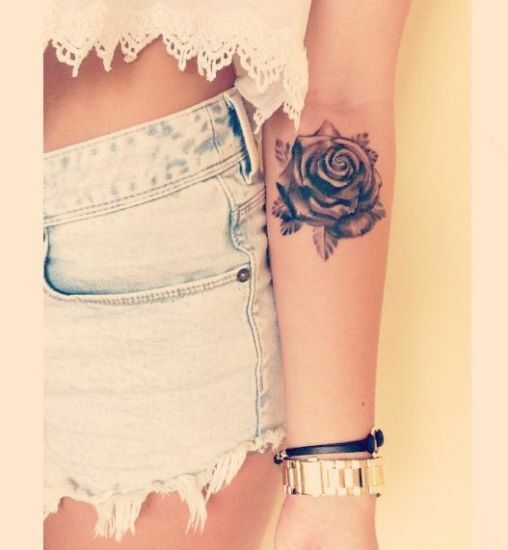 Most of the women will have the desire to choose the rose colour tattoo as they will look cool and pleasant. Having those pictures of rose tattoos designs will denote the femininity and you can get the extra beauty by having the butterfly images. 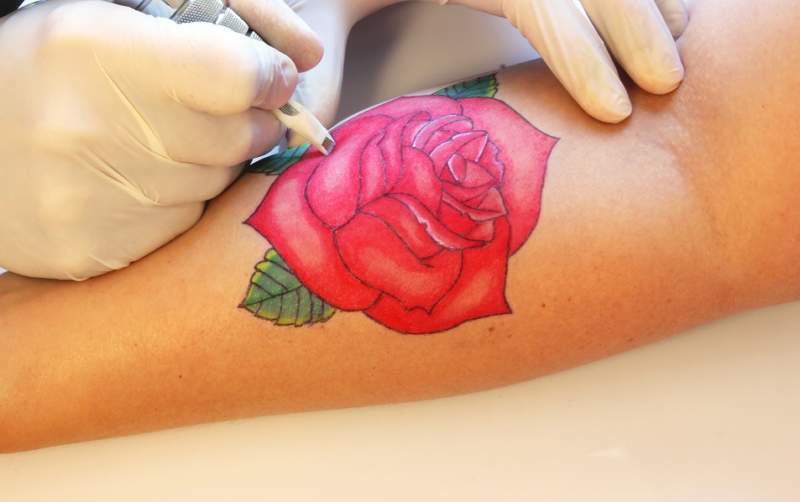 Make sure to use inks in different colours to achieve the perfect pretty rose tattoo. Body Placement: Place this beautiful rose on your back or on your side of ribs. Suitable Gender: A design more suitable for women. 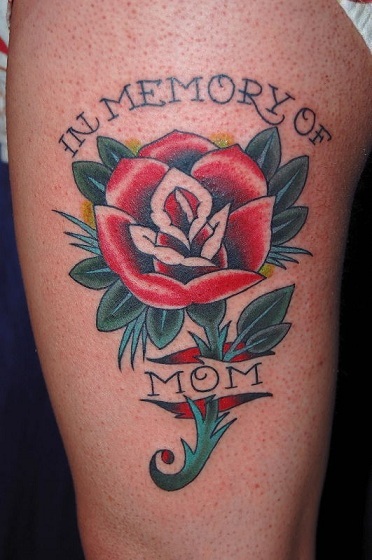 Roses tattoo designs can also be tattooed as a memorial one in remembrance of any such person who stayed with us very close to our heart and was loved dearly by you. You can get these memorial tattoos very easily by adding your choice of words if you want to dedicate it for your loved one. Skin Tone: Best on all skin tones. 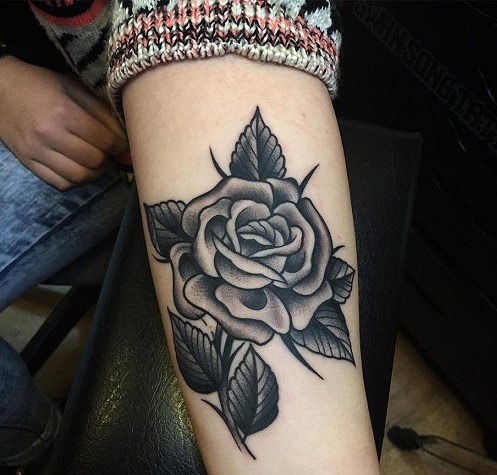 Even though roses are available in multiple colours, having the black rose tattoos images will be damn beautiful and elegant as the black colour will always be attracted by a large number of people. 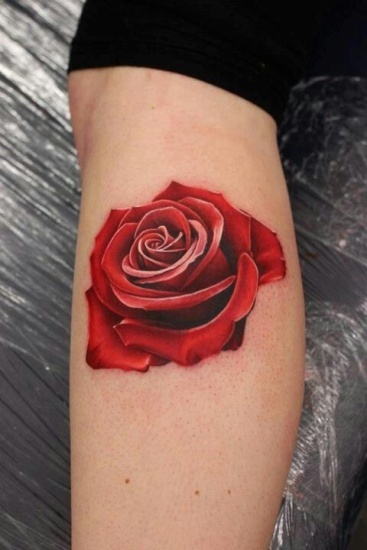 It is one of the best rose tattoo designs for women. Ink Colour: Stick to black and shades of black. Suitable Gender: This design is more appropriate for women. Bright red roses are always known around the world for their symbolism of love and getting tattooed with the pictures of rose tattoos designs with a red rose will mean that there is a message that has to with loving someone deeply. Suitable Gender: Women generally love this type of design. As we are living in a trendy world, day by day the trend keeps on changing and it doesn’t leave the idea of tattoos too as these are now becoming familiar with 3D technology. 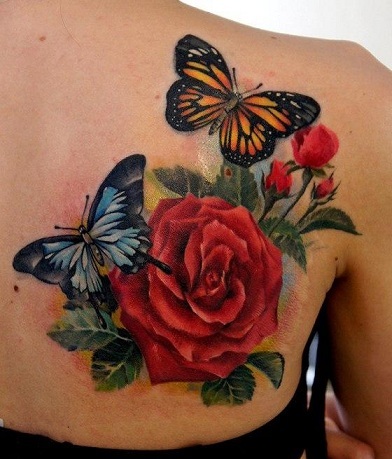 If you want to be the explorer of trend and fashionable world, try to go with 3D rose tattoos images. But be careful to choose the colour as it is significant to its meaning. 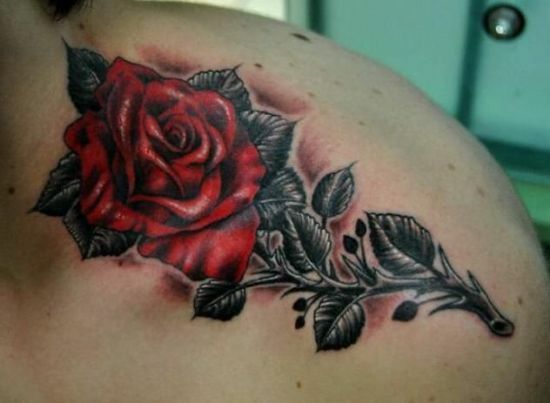 It is one of the great rose tattoo designs for girls. Rose tattoo with love quote on the wrist has been becoming familiar as this tattoo style insists the favourite love quotes. 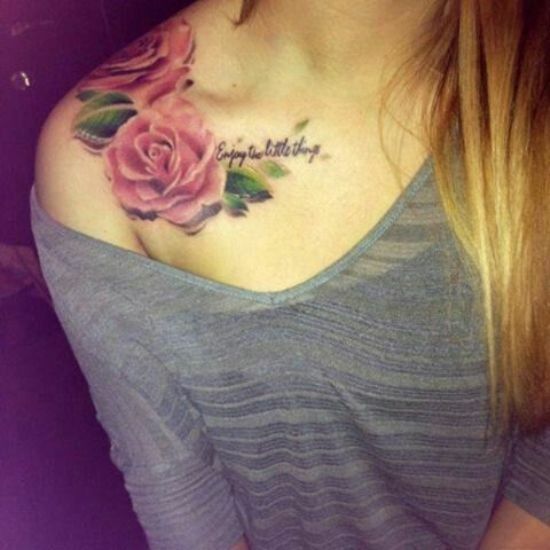 Getting the images of rose tattoos with any of love quote will be romantic and can be dedicated to their loved ones. It has been becoming familiar among the lovers but, while trying this type, try to have a black colour tattoo as this will be unique and fashioned. 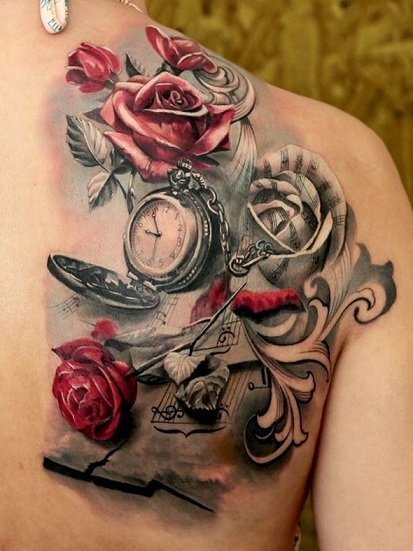 Though there are plenty of tattoos available, choosing the images of rose tattoos with a clock will stand out from the crowd. Persons having this tattoo will look unique and attractive and this can be tattooed along with any love quotes. Body Placement: Place this on your back or on your thighs. Ink Colour: Choose shades of black along with red. The types of roses available are many so check and research about all those types of roses and then settle down with one particular type. You can complete the look of a rose tattoo with adding other elements such as quotes, or things that have a significance in your life. The rose tattoo design you choose must be appropriate for the body part you are planning to get inked to achieve the perfect look. Get a custom rose tattoo design made with the effect you want with the help of a tattoo artist so that they can guide you and make any changes if and when required. Its your tattoo that is going to be inked on your body part so don’t be hesitant and ask the artist any concerning questions beforehand. The stage of blooming of your rose tattoo also means a lot in the message it sends. For those considering to have a rose image tattoo, but are concerned about the design does not reflect their true way of life or image, just consider some of the historical facts regarding this magnificent rose flower and feel comfortable with having a tattoo incorporating a rose in the design. The tiniest of rosebuds in rose tattoo designs means that the wearers looks young and still stay in the beginnings of exploring the world.